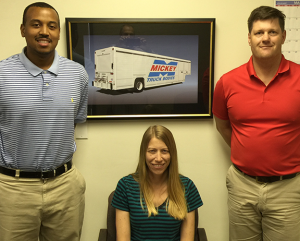 Mickey Truck Bodies has expanded its Engineering Team with the addition of two new experienced designers – Sean Gilboy, Mechanical Design Engineer, and Justin Graves, Mechanical Designer. They both report to Marlowe Bright, Automation & Production Engineering Manager. Sean, a certified Lean Six Sigma Green Belt, was most recently a Senior Design Engineer with Beta Fueling Systems, a Reidsville, NC-based major supplier of refueling equipment to the aviation industry. Overall he has over 20 years of experience in mechanical design taking products from concept to production and holds several patents in his field. Sean earned a Bachelor of Science degree in Engineering at Parks College of Saint Louis University, and is currently pursuing an M.S. Engineering Degree at North Carolina State. At Mickey he is assigned to both Emergency Vehicles (EV) and Beverage equipment. Prior to Mickey, Justin worked in product design for Leggett & Platt, a leader in the manufacture of home furnishings machinery and a large supplier of a wide range of products and components for the home, including mattress springs and carpet cushion. He earned his AAS in Mechanical Engineering Technology from Guilford Tech and is also a Certified SolidWorks Associate and experienced tool designer. Justin is assigned to Mickey’s EV product line. In another move, Molly Norman, Engineering Assistant, has been given additional responsibility on the Epicor Implementation Project, where she is working closely with Kevin Gentle, CAD/PDM System Administrator, to bring the Epicor Engineering Workbench to fruition.